Perfect Picture Book Friday will begin next week (although since that’s the day I’m involved in Erik’s blog tour, my first PPBF pick won’t be posted until September 20th.) Today I’m sharing a book that, although it has 32 pages like a picture book, and has text and illustrations, it isn’t a picture book. The publisher calls it a “novelty book” and it’s certainly novel, in the sense of being unusual. Unfortunately, the cover image I was able to find doesn’t give the wonderful holographic effect of the actual cover, which makes you feel as if you’re looking out of the porthole of a submarine to the three-dimensional ocean world beyond. Publisher: Somerville, MA: Candlewick Press, 2009. Themes and topics: Ocean myths and legends, ocean facts, fanciful story of voyage of Nautilus. Opening Sentences: Within these pages, I, Zoticus de Lesseps, will set down a faithful account of an incredible voyage that began on April 3rd, 1863. Much will seem too fanciful to be real, but everything that I recount here did, in all truth, occur. Using a fascinating format, part journal, part scrapbook, the author (under the guise of a character named Zoticus de Lesseps) tells of journeying with Captain Nemo aboard the Nautilus, the undersea ‘ship’ of Jules Vernes’ Twenty Thousand Leagues Under the Sea. 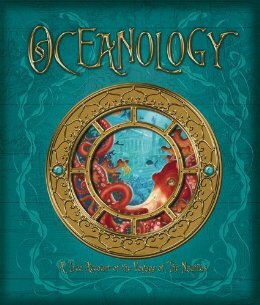 In a story that weaves together fantasy and scientific fact, kids are drawn in to learn much about the ocean, its creatures, currents, and behaviors, while following an exciting and imaginative adventure. The thirty-two thick pages of the large book are packed with journal entries, illustrations with descriptions, as well as interactive features such as little booklets, fold-out maps, envelopes with letters in them, all sorts of things which are scattered throughout the book, making the perusal of the book a treasure search in itself. This is the sort of book a child could pore over for hours. Activities/Resources: There are fascinating websites that introduce oceanography to kids. A couple are Oceans for Youth, and Sea and Sky. Nova (PBS) provides links to several oceanography activities for kids of various ages. The Science Kids website from New Zealand gives cool facts about oceans. If you are fortunate enough to have an aquarium nearby, such as the Vancouver Aquarium in British Columbia, Canada, or the Mystic Aquarium in Connecticut, USA or any of the other aquariums where research and conservation are the major purposes, rather than entertainment, a visit will further the learning begun with this book. The cover has that marine blue beautiful color and the porthole idea if fascinating. I can imagine this would be a wonderful read. Thank you for sharing. It is indeed a wonderful read. There are other “ology” books — I may see if the library has any of them. If they’re anything like this one, they’ll be great! The cover is really beautiful even though we can’t experience the holographic effect. What an adventure for older kids, with much to imagine and explore through the page inserts. I really like the idea of this book. This book sounds fabulous!!!! What a fun concept and story. I’ll be checking this one out for sure! Thanks for sharing! Hope you enjoy it, Rhythm! Thanks! I think we shall be seeing more books using multiple features and forms to convey the story, like this. Great find, and I know some kids who would love this style and content! Good point about the multiple features and forms becoming more and more prevalent, Joanna. This is a great book — it happened to be displayed facing outwards on the library shelf, and I was irresistibly drawn to it. This book sounds like a treasure that kids and adults will enjoy. I will have to see if I can find a copy and have a look. Very neat! We have (or had…might have given them away now that the kids are older) Wizardology and Egyptology. Love these books! i enjoyed the Dragonology and Egyptology books. even my father enjoyed the Egyptology book, and he’s an Egyptologist. this one looks just as worth reading as the others. I totally want to read this version. It sounds much easier than my french version of the Jules Verne book 😉 Congrats on being an editor now, Beth.